I am currently exploring Quinoa in my cuisine. Quinoa is a grain-like crop that originates from South America. In recent times it has become highly appreciated for its nutritional value, as its protein content is very high (12%–18%), and is a good source of vitamins and minerals - iron, magnesium, Vitamin E, potassium, amino acids, and fiber. 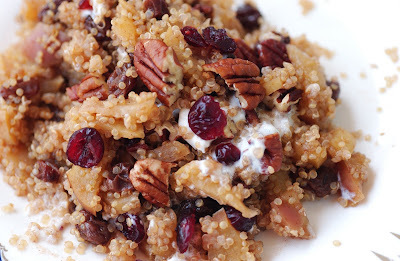 Quinoa has a light, fluffy texture when cooked, and it is mild with a slightly nutty flavor. I love its versatility as it can be used in sweet and fruity breakfasts, savory main dishes and fresh salads. Rinse the quinoa. Bring quinoa and water to the boil in a medium sized saucepan. Reduce heat and gently simmer for 5 minutes. Add the apples, raisins and cinnamon. Simmer until the water has absorbed. While quinoa is cooking, toast the nuts in a dry pan for a few minutes over medium heat. Transfer to serving bowl and sprinkle cranberries and nuts over the quinoa. Serve warm with dollops of yogurt or cream and sweeten with honey/agave syrup if desired.